Laura Whetherell has three kids and lives next to a cornfield in Champaign, Illinois. 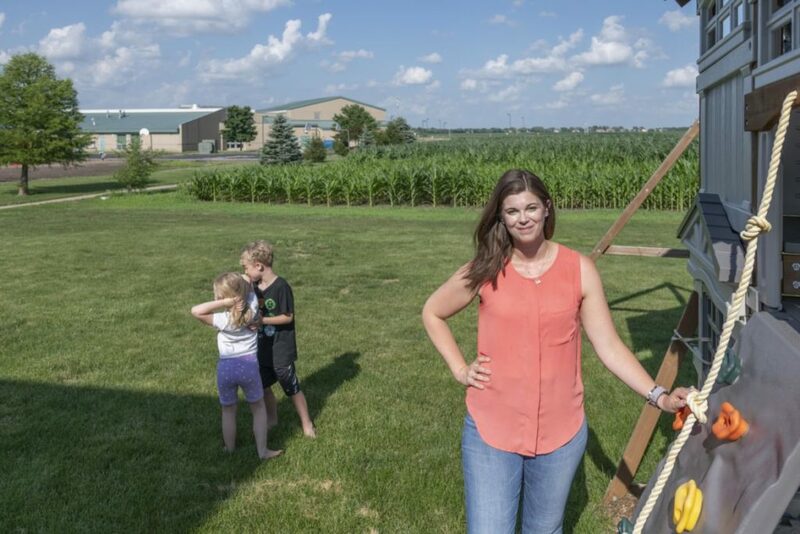 Her kids either attend or will attend Barkstall Elementary, which has a playground that borders the same cornfield (back left). The Midwest Center for Investigative Reporting has placed an air sampler at her home to test for pesticide drift. As a friend of mine who also works in journalism put it, you wouldn’t invite strangers to a party and expect them to show up and have a good time. Similarly, asking someone to take time out of their day to attend an event to help your reporting is an inherent risk for them. So how do you ensure it’s not a waste of their valuable time? I walked into Flesor’s Candy Kitchen in Tuscola for our “crop up” newsroom in May hoping to bring people into our thought process as journalists as the Midwest Center for Investigative Reporting pursued a new project. We had recently placed air samplers in small towns around central Illinois to measure pesticide drift from agricultural fields onto backyards and school playgrounds (you can read more about that reporting project here). I wanted to hear from the people who lived in the areas near the samplers to see what questions they had, and to explain what we were measuring and why. But the scant handful of people who did show up were more interested in hearing about the results from the air samplers, which we didn’t have yet, than sharing their thoughts. Something wasn’t working right in the normally busy diner, but this fellowship is all about figuring out what works for the public we were trying to reach. As the engagement fellow at the center, I organize these events to ideally bring together stakeholders from diverse backgrounds and give attendees the opportunity to ask questions or contribute their own perspectives that will help guide our investigative journalism. But making these events successful for both the public and journalists in rural communities can be a challenge, in part because of simple geography. While the center’s focus on agriculture and agribusiness has implications for everyone, the people directly affected are often farmers and farming communities spread around the most rural parts of the state. How do you bring those people into events, and more importantly, into your reporting? At Flesors and later at Andy Mae’s Ice Cream Shoppe in Bismark, I discovered that when you’re trying to reach people, give them a reason to come to you. Have a good foundation of data that you’ve uncovered early in your reporting to get people in the room. We can’t presume people will value our work until we’ve proved to them we understand what they need. Showing up with valuable information to share is why integrating working reporters into engagement efforts is so critical. 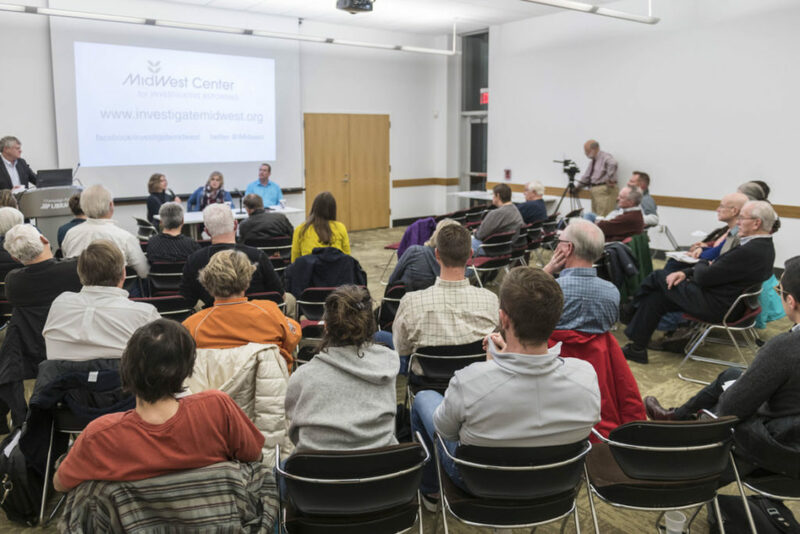 In February, the Midwest Center hosted what I think was its most impactful discussion at the Champaign Public Library about our reporting on Dicamba, a controversial pesticide that damaged millions of acres of soybeans when it unintentionally drifted across fields. It was a national story, and one that we had been following closely as it played out right in our own backyard. We shared a few highlights from our recent stories, moderated a panel discussion with experts — some who had been featured in our reporting— and then opened it up to questions. It was a bustling audience of farmers, environmentalists and curious students and residents from the area, not a group that is normally in a room together. What brought them there was a shared problem and a mutual need for expertise and understanding that gave value to our reporting and what the panelists had to say. The event had required a lot of reporting trips beforehand. I had taken days to drive out to grain elevators, professors offices and small-town meetings just to get to see people in person. It’s easy to lose sight of the importance of those face-to-face interactions, something community reporters have been doing for as long as there have been community reporters. Taking a drive, knocking on doors with a story to share is sometimes what it takes to get someone to share theirs. We need to go to them. It’s as important to give people the respect of meeting them where they are and offering something before we ask them to share with us. There is a misconception among some of the leading voices in engagement journalism that reporters have always been bad listeners. Now more media organizations are able to say, “We’re listening,” or “We heard from the community that…” It’s true that the media, in general, could do a better job of having a consistent presence in rural communities, in minority-majority neighborhoods, and in low-income neighborhoods. However, hosting an event solely around the journalist in the role as listener or with the expectation that hearing from a handful of people provides insights into an entire community is also the wrong way to look at meaningful connections with the readers you’re trying to reach, at least it was for us.